So you’ve followed my advice and thrown yourself a killer dinner party chez toi, reaped the appropriate glory and even tackled the washing up (ok, let’s not go too far). You wake up the next morning, still glowing from your culinary success, but that sad, leftover crustificating baguette sitting on top of the freezer somehow puts a downer on things. It just didn’t get to fulfil its breadly purpose, poor lamb. You pick up the rigid has-been and gallop around your minuscule kitchen for a while sword fighting with the apron hanging on the back of the door, before your inner adult gets the better of you and you come over all frugal-like. It’s not a weapon. I am not a jousting knight from the Middle Ages. There’s a meal to be had here if I’m just bold enough to take the chance. And a damn fine one at that. Porridge is all saintly and minimalist as breakfasts go, but nothing says decadence like French toast in the morning. 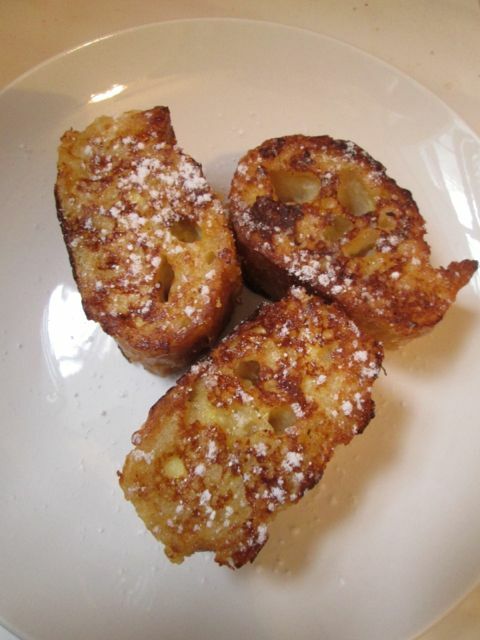 Here it’s done pretty sweetly and simply in the classic dish pain perdu, literally translating as ‘lost bread’. It’s a recipe akin to food alchemy as you take an otherwise wasted castaway from an imminent mouldy demise and transform it into fluffy, sugary magnificence with just a few added ingredients. If breakfast to you spells as much coffee as your veins can handle before a mad dash to the bus, you needn’t let the delicious second-chance magic of it all pass you by. Though in many parts of the world French toast is considered an a.m. delight, here in France it’s quite allowed to tuck in for afternoon tea or dessert instead. Though if you take a look at the ingredient list below you’ll see how much of your svelteness might be lost if you sample all three (click here for a guide to losing the kilos for free in Paris). 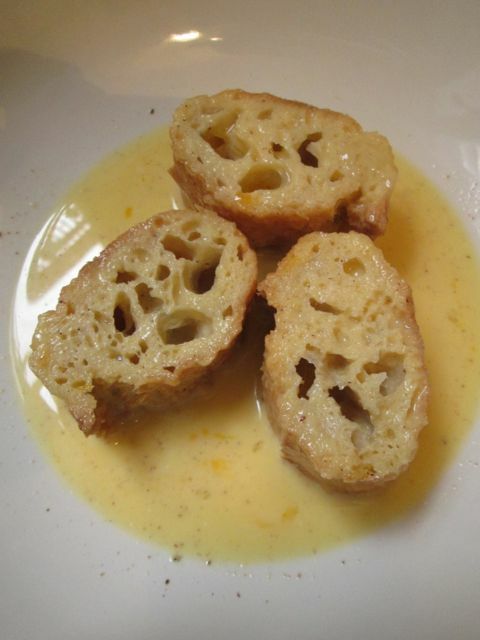 Put everything except bread and butter into a shallow bowl and beat together to make a custard. Soak bread slices for ten minutes, making sure they’re covered on both sides. Melt butter in a pan and fry for about three minutes on each side. Serve with a dusting of icing sugar, fresh berries or a scoop of vanilla ice cream. And a jog afterwards, obviously. Oh, how I wish I wasn’t gluten free 😦 This looks and sounds sooo yummy! I’ll find a gluten-free recipe for the next baguette post! Well, aren’t you just the bee’s knees, Kim 🙂 Looking forward to it!